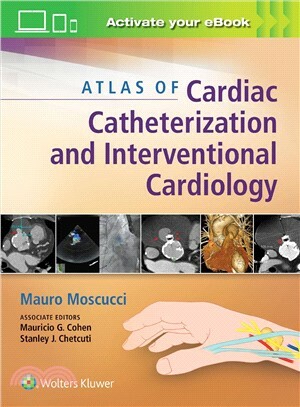 Comprehensive, current, and lavishly illustrated, Atlas of Interventional Cardiology thoroughly covers all of today’s cardiac catheterization and coronary interventional procedures, including catheterization and stenting techniques, angiography, atherectomy, thrombectomy, and more. Full-color illustrations and procedural videos guide you step by step through every interventional procedure you’re likely to perform. A one-of-a-kind, practical atlas, ideal for interventional cardiologists, trainees, and general cardiologists. Each chapter includes an introduction, several case studies, conclusion, and pertinent references. Complete coverage includes chapters on Catheterization in Childhood and Adult Congenital Heart Disease, Pitfalls in the Evaluation of Hemodynamic Data, Coronary Artery Anomalies, Pulmonary Angiography, Intravascular Imaging, Interventions for Structural Heart Disease, Thoracic Aortic Endovascular Grafting, and many more.